Elvis' BMW Restored - Misc. BMW’s iconic 507 model is one of the brand's rarest cars, with a production figure of only 252 units. So, every single one (that survived) is extremely valuable, but this Elvis Presley-owned model is in a league of its own. The story begins when Presley was stationed in Germany, where he originally bought the car. The legend has it that the BMW 507 was white to begin with, but Elvis got tired of women writing their phone numbers on the side of it with lipstick, so he repainted it red. The 507 had a rough history to begin with, as it was displayed at the Frankfurt Motor Show, used as a press car and raced by Hans Stuck. When Presley actually took delivery of the car (second-hand, obviously), the dealer installed a brand new engine in it. Not much more is known about it afterwards, but a few years ago, the car was found in Jack Castor’s barn, who purchased it in 1968. 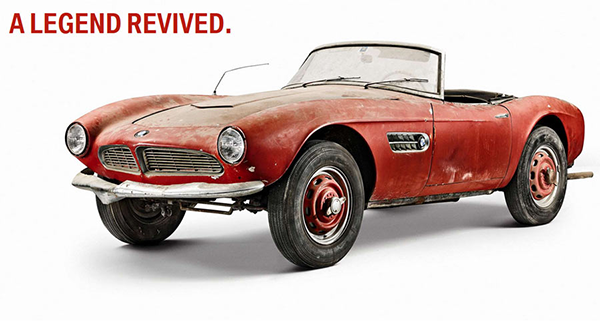 It wasn’t in a very good shape to begin with, after staying hidden for most of its life, but BMW vouched to repair, replace and reconstruct its frail body – but not before showing it at the BMW Museum under the “Elvis’ BMW 507: lost & found” exhibition. Fast-forward two years, and the car is almost ready to impress with its stunning beauty once again, as BMW finished the restoration just in time to showcase it at the Pebble Beach Concours d'Elegance. The roadster passed through a total of eight compelling restoration stages, implemented with painstaking devotion and finesse by BMW’s classic car experts. Before the car made its way back to Munich, it underwent six paint jobs (including the King’s own), so BMW restored its original, elegant hue. The Bavarian marque also reconstructed the engine, and took the whole car apart to make it brand new again. But we’ll see more of the 507 once BMW unveils it at the 2016 Pebble Beach Concours d'Elegance Sunday, on August 21. This reminds me of the house/shack where Elvis was supposedly born which is probably not on the original site and the interior has been changed etc. and bears only a rough similarity to the 1935 birthplace i.e. quote above - repair, replace and reconstruct !!! Well done BMW, I can't wait to see the final result. The few cars that were on display at the O2 last year were great.